DAP® is a synthetic copy of the natural canine appeasing pheromone proven to help support dogs in a range of stressful situations. 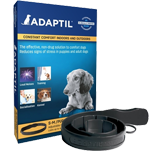 DAP® is canine specific, odourless, non-sedative, non-systemic and can be used alongside all other types of medication. The efficacy of DAP® has been demonstrated in 18 studies published in scientific journals and at veterinary conferences around the world. For puppies - DAP® is shown to help puppies settle in a new home and to have significant positive effects on puppy socialisation . Fitting a DAP® collar to puppies from 6-16 weeks helps puppies develop into confident, well-behaved adult dogs and significantly reduces the likelihood of anxiety-related conditions developing in later life. 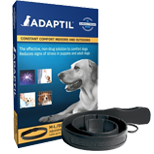 For adult dogs - DAP® has also been shown to help dogs cope in kennels , during rehoming and in a range of other stressful situations such as during firework exposure and car travel. Find the D.A.P. Diffuser for the best prices in Multi-packs here! 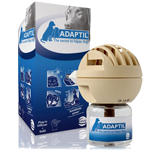 Get started with the Adaptil DAP refillable diffuser. Just plug into an open outlet for 30 days of stress relieving pheromones for your dog. 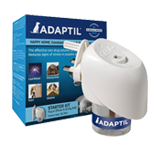 Make sure that you stock up on Adaptil refills so that you never run out. 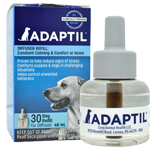 If you travel with your dog, try the Adaptil collar or spray. try Fiproguard, the effective and inexpensive topical!